First extract all the files in Data Files Folder into the Morrowind\Data Files directory. 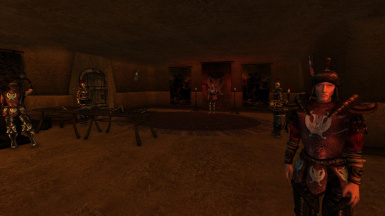 Open Morrowind launcher and select "Welcome to the arena!.esp". 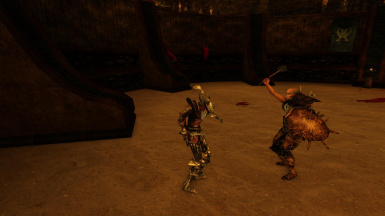 With this mod, you can fight and bet for fights in the Vivec's Arena. 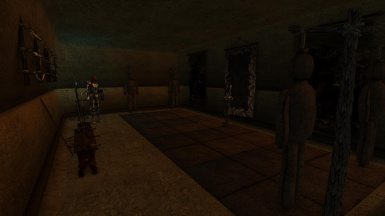 Like in the the Imperial City Arena in Oblivion, there are apparent teams of combatants and scheduled matches. To start you'r journey, talk to one of the arena masters in their bloodworks about "Join the arena". You need to be at least level 10 to join. After joining, you can fight in rank related matches or against monsters. Just ask about this from your arena master and of you go! - There are 25 rank related battles, and after you have been named as the Grand Champion, you can still fight against the Champions once a week. Some of these fights can be team fights, so it is adviced to ask someone in your team to join you. - You can fight against arena monsters once a day. - There are fans watching and cheering in the pit when you fight in there. Fans appear also during the other fights in the arena. Against the Arch-Mage, the ArchMagister of Redoran, Garding the Bold and the Knight of the Imperial Dragon. Also during one of House Redoran's quest, whitch name i don't remember. - If you are gambling type, you can bet for other arena combatants. Only you have to do, is to speek to Cocius Coloni in the pit (between 10 am. to 6 pm.). - During ranking matches and champion fights, there will be spikes placecd in the edges of the pit and yes, they will hurt you when you run/jump at them. - Some of the fights are "unique" in their own way. Be prepared for these. You have been warned! - Ask other arena teammates to join you in team fights. They will level up if you win the fight with them (max 4 times). You can also give potions and scrolls to them, chance combat tactics and ask various questions from them. - You can ask other NPC's (excluding guards, condoliers, arena fighters, king, queen mother, some of the important quest givers) to a fight to the death! If they hate you, they will accept it. But be prepared! If it looks like that the one you challenged is wearing nothing at all, and if they have skills, they WILL bring some equipment to help them! 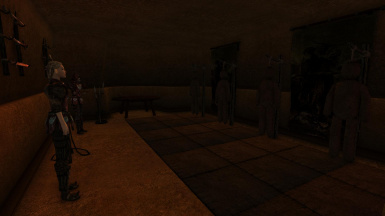 In order to get the "-Challenge" topic, talk to people of Vivec about the "Arena" to get that topic. - An unique options stone placed on each bloodworks that enables you to: change the difficulty of the fight, enable\disable stuff in FPS optimizer menu, enable\disable need for the battle cuirass, Enable\disable the final battle music. That is maybe all i need to say about this mod. Fight with honor Pit Dog! next to the Welcome to the Arena!.esp file. - As always. Backup your original save games. - If you have old version of this mod and you replace it with new version, you might encounter something that shouldn't be happening. I recommend to use latest version of Wrye Mash and using "Repair All" command if you are planing to replace the old mod or if you are having something else. - If you don't want to do the things above, simply start a new game. 1. Will this interfere with any quests from the main game that involve the arena? Answer: I haven't touched any of those scripts so don't worry. 2. When i waited in the pit, i noticed that Tanusea Veloth disappears somehow. What i have done wrong? Answer: Nothing. It's not my fault too. 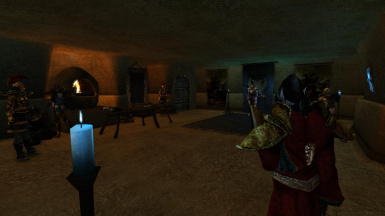 Sometimes, Tanusea Veloth isn't at the Arena, then you will have to reload Morrowind or use the console. 3. I don't think i'm extracting it right. 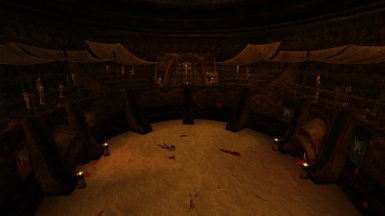 I can't find the bloodworks and the arena pit still looks like it did before the mod. What do i do? Answer: Go to Morrowind Launcher->Data Files and check the tiny white box left from the Welcome to the Arena!.esp File. 4. Where are the bloodworks? Answer: In the waistworks. You CAN'T miss them. 5. Is this combatible with Gladiator mod? Answer: This mod is Incompatible with Gladiator mod. 6. Is it possible to levitate in the pit? Answer: Well...Yes, but you will be disqualified. 7. How many times i can be disqualified before i'll be expelled? Answer: First time when you're disqualified, you get warning. Second time you will be expelled, and cannot rejoin the arena. 8. How bad is the Grand Champion? Answer: You have to see it your self. 9. Is this mod incompatible with To the Death mod? Answer: Maybe. I haven't tested it so i cannot be sure. 10. One of the practice dummies got broken. How do i get them repaired? Answer: They will respawn after 3 days. 11. Does the spikes during the ranking match hurt you? Answer: Yes, but only if you run/jump at them. 12. Does this mod reguire MWSE or any other program to run? 13. Is this mod combatible with Morrowind Patch Project and Morrowind Code Patch? 14. Is there any place in the bloodworks to store some of my items? 15. Is there anyway to leave the pit while fighting? Can it be done by scripted items? Answer: Even if you leave the pit using item like Berne Amulet, you will be disqualified. 15. The person supposed to let me bet on fights isn't there, and no fights are happening. Anyone know how to fix this? Answer: It's 50% chance that there is a fight or not. -Battle Cuirasses don't have their reflection shown. -During the final battle (and if final fight music is enabled), if the fight somehow interrupts (Golam stops fight, or he's charmed), the final fight music stops and starts to play again when script's timer is 0. Use these fixes if you don't want to encounter these bugs. If you are suffering from low fps in the pit, you can adjust these settings to increase fps. For example: removing half of the spectators from the pit to increase fps. (!NOTE! You have to make sure that the pit is empty before enabling/disabling stuff.). If you don't like the music track that is played during the fight with the grand champion, you can disable it and listen the original soundtrack. You can remove the need of any arena armor with this. Once disabled, you can freely use any kind of cuirass that you want. If you want to have some challenge, you can enable the need of the cuirasses at any time. You can set the leveling rate of your enemies in the arena. Later difficulties also enhance the damage done by the enemy. 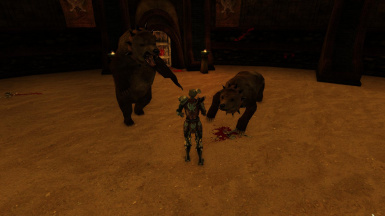 This mod is incombatible with mods like: "Gladiator" and "Morrowind Inhabitants, freeform", and any other mods that add similiar arena fights. download wouldn't take so long. Version 2.0 Added animated practice dummies to the training area. Version 2.5 - Fixed couple of bugs. - Fixed so called "all the combatants against you bug" that appeared in Gladiator mod and also in the older versions of this mod. - As a Grand Champion, you can still fight against the Red Team's Champions once a week. 06.16.2009 - Removed 90% alarm rating from fans. 06.19.2009 - Added two more esp:s for those who want some "over powered" combatants. Final's Final version 4.0 - Fans appear also during the other fights in the arena. Against the Arch-Mage, the ArchMagister of Redoran, Garding the Bold and the Knight of the Imperial Dragon. 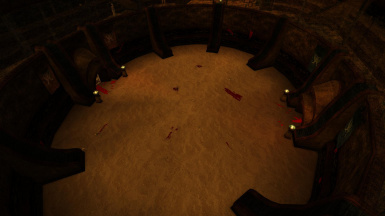 - Made the arena bloodworks more darker and also replaced the beds in the resting area with bedrolls. - Now in every ranking match and every champion fight, there will be spikes placed in the pit. Yes, they will hurt you if you run/jump to them :). - Now you can repair the dummies even if you're not a member of the arena, but it'll cost more. - Now when there is match going on in the pit (like challenged the arch-mage or archmagister), the spectator area is closed. You have to go trough the bloodworks to get to the pit. - Made some dialogue fixes...again. 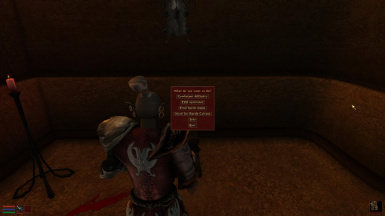 08.23.2009 - Fixed a bug that you could still fight duels even if you were expelled from the Arena. - Now you are able to loot opponents corpses and leave the pit trough the door, but you will be expelled. - Champions are also more "randomized"
- Fixed music files path for "GC fight" and "silence"
- Mod is now compatible with "LGNPC - Tel Uvirith"
You may not upload this mod anywhere else, but if you plan to use any part of this mod ( including meshes, textures and icons ) in your own mods, you have to ask permission from me. Bethesda for this wonderful game.